Manga isn’t really my thing. 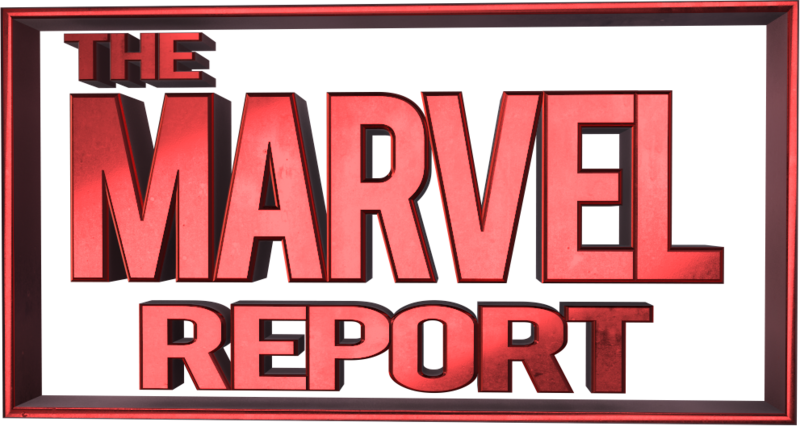 When I took the Marvel Zombies review, I had no idea what I was in for nor did I have any idea that I would be reading Manga. Quite simply, I discovered that I am not a fan of Manga. It does nothing for me, but I am going to try to review this book in a way that is respectful of the artform, but also representative of what the artists and creative team were going for in their work. At the end of the day, my review for the comic is simply my review. It should be taken as a review of someone who doesn’t care for Manga and didn’t find the book enjoyable. If you like Manga and you think Marvel has done a great job with their Manga, then Marvel Zombies is a critically acclaimed series that will likely have a lot to offer you, the reader. Plot: After saving the planet from another incursion, the Avengers are once again the heroes of the day, but not without taking damages of their own. 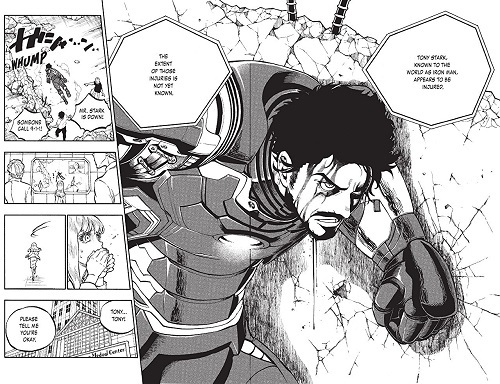 Severely injured, Tony Stark is being tended to by a team of doctors and Jarvis when Pepper begs him to reconsider his trade. After making a tongue-in-cheek comment about wishing crime, poverty, and war were bugs like in a computer system, Stark sets out to do just that, but little does Pepper know that the real reason behind his motives is a letter threatening her safety unless he destroys all his Iron Man suits. Just as Tony is about to destroy them, Brad, a former employee and the letter’s author, shows and the two do battle. 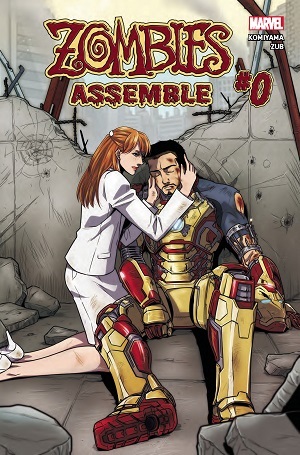 After it’s over, Tony announces he is giving up being Iron Man and introducing the world to his new A.I. system, Ultron. Story: I will get to the story analysis or Marvel Zombies, but I feel like a Manga analysis is important for the uneducated. This is by no means a textbook definition, just my experience. If you’ve never read Manga before, you’re supposed to read it right to left. This was something I missed when I flipped past the title pages. Then there was getting used to the randomness involved in a Manga comic. At one point there was a random pop singer in Tony Stark’s hospital room. He was only in there for one panel, one drawing, but he’s part of the charm of Manga. Also, all Manga is in black and white. Now on to the story by Yusaku Komiyama. As for the story, once I got past the culture shock, it actually played out like any normal Marvel story. It featured an antagonist with a reasonable excuse for coming after Stark and Pepper. Even the setup for Ultron was rooted in a next-generation technological idea; reducing war, poverty, and crime to bugs in a system. It’s very Person of Interest. 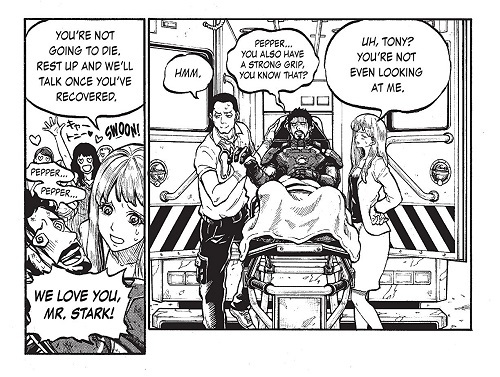 Even the notion of Stark keeping a threatening letter about Pepper from Pepper plays well and should jibe with readers. As a story, it flows together fairly well and is actually pretty amusing when you add in the idiosyncrasies of Manga. 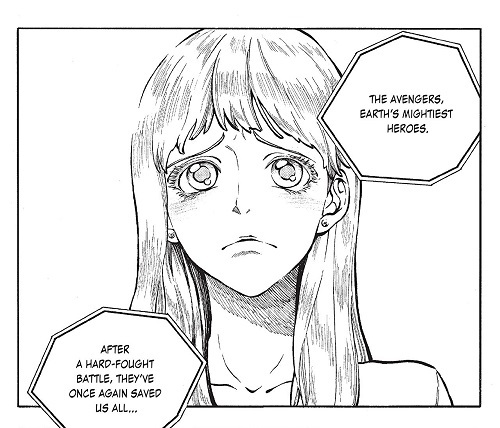 From my little experience with Manga and Animé, Zombies Assemble blended traditional styles with Marvel content rather seamlessly. The reveal of Brad the ex-employee as the villain was done in an amusing fashion, but it also didn’t seem out of place with the rest of the story. The only thing I would say with this Manga, maybe it’s the case with a lot of them, but the story did feel rushed. It’s nothing that will take away from the experience and may even be the status quo, but it bugged me. Art: I am in no way an expert on Manga. I couldn’t tell you if the artwork in Zombies Assemble was done well or if it was poor for the genre. I can tell you that the artwork looked crisp to me. There’s something uniquely charming about reading a comic without color. At first I didn’t like it, but it grew on and I found myself appreciating the hard work that goes into detailing something without the luxury of color. It can’t be easy to blend Americana with Manga, but what do I know? We established that; not much on Manga. All the characters in Zombies Assemble looked authentic. Landmarks such as Avengers Tower were drawn so that they were instantly recognizable to the reader. The battle-weary look is something Yusaku Komiyama draws to perfection. As a whole, Komiyama did a remarkable job when you consider one person was totally responsible for the writing and the artwork. This was truly a visual treat.